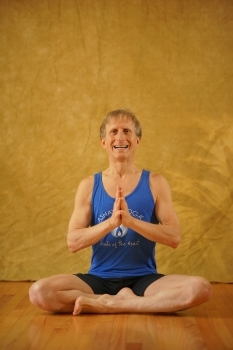 Todd Norian, E-RYT 500, is an internationally acclaimed yoga teacher. A student of yoga since 1980, he has immersed himself in many styles of alignment-based and heart-centered yoga. In 2012, he founded Ashaya Yoga® (AH-shy-ah) – a Sanskrit word that means, “abode of the heart” – which blends precise alignment techniques with empowering and spiritually uplifting philosophy. With warmth and humor, Todd excels at making deep philosophical teachings accessible and relatable. As an accomplished musician, Todd has created several music CDs for yoga, meditation, and relaxation. Todd welcomes students of all levels to awaken to their inherent potential for unlimited joy, vitality, and fulfillment. Practice with Todd online at Shri.tv.com. We are all made of the five elements: earth, water, fire, air, and sky. Masterful living is achieved when these elements are balanced within. When out of balance, you may feel "contracted" (too much earth); "under water" emotionally stressed out (too much water); unmotivated (not enough fire) or overworked (too much fire); scattered and fearful (too much air), or spacey and ungrounded (too much sky). During this intensive, learn the yoga philosophy behind the five elements and practice an inspiring sequence of alignment-based, therapeutic postures that brings a balance of strength, flexibility, and balance. The Ashaya Yoga® method brings about a flowing integration of all five elements that leaves you feeling strong, confident, peaceful, openhearted, and ready to engage with life from a place of worthiness. Take your teaching and practice of yoga to a deeper level of excellence. During this intensive you learn the techniques and skills necessary to be able to give unforgettable hands-on adjustments that will transform your students forever. Using the precise alignment techniques and inspiring philosophy of Ashaya Yoga®, you learn how to transmit your highest intention through touch. Transform your body, mind, and heart in this amazing yoga workout. Progress step-by-step and safely into refreshing, creative, and seamless sequences of accessible, yet challenging asanas. Receive expert instruction in both alignment and flow in standing poses, hip openers, hand balances (with modifications), backbends, forward bends, and twists. The shoulders are like the wings of the heart. When properly aligned, they free the heart to open and soar high above all self-limiting beliefs and concepts. During this workshop, you will discover the optimal position for your shoulders and neck. Through the application of the sophisticated and elegant alignment essentials of Ashaya Yoga®, you will learn how to avoid injury and relieve chronic pain. This yoga really works! We’ll look specifically at restoring rotator cuff tears, winging shoulder blades, frozen and tight shoulders, and sore neck. You will leave this workshop with tools, practices, and the knowledge to free yourself of pain and return to your natural state of ease and well-being. This elegant pose produces enormous exhilaration, vitality, and empowerment—and fear, if you don’t know how to approach it. This step-by-step clinic will teach you how to playfully approach the pose in a safe and systematic way. Using the therapeutic alignment techniques of Ashaya Yoga®, you’ll learn the biomechanics and subtle body actions that will enhance your enjoyment and understanding of this pose. Take home developmental sequences, strengthening exercises and the confidence to take your practice to the next level. Whether you are trying this pose for the first time, or working with advanced variations, have fun working at your own level in this supportive, playful learning environment. If you are prone to tight hips and lower back aches, then this workshop is for you. Using the precise, therapeutic alignment method of Ashaya Yoga®, you practice a sequence of poses designed to open, balance, and heal your hips, legs, and lower back. Release tension and find the place in the middle where your heart opens and you realize your true nature which is joy. Backbends open your heart for you see your true self, which is joy. Through the revolutionary practice of Ashaya Yoga®, you take your backbends to the next level. Discover how to work your legs, hips, and shoulders to counterbalance pressure in your lower back such that your backbends are pain-free, and you are able to access new levels of joy and possibility. Move step-by-step through a sequence of backbends that build to a pinnacle pose. Let the fragrance of freedom waft off the mat and into your life.